Montana Bones was started by Dana Holzer as a way to showcase her love for Montana. We are an authentic family design collaboration spanning four generations and four Montana locations: Moccasin, Bozeman, Jordan and Helena. We offer handmade clothing and accessories from rural and small town places. Montana Bones…the real deal. Dana serves as the lead designer, seamstress and maker of the various x-ray Montana animal shirts and women’s skull shirts. Our fabric printing is done in Helena and Anaconda, and we are designated as a “Made in Montana” small business. Dana wrangles the day-to-day operations of the business. 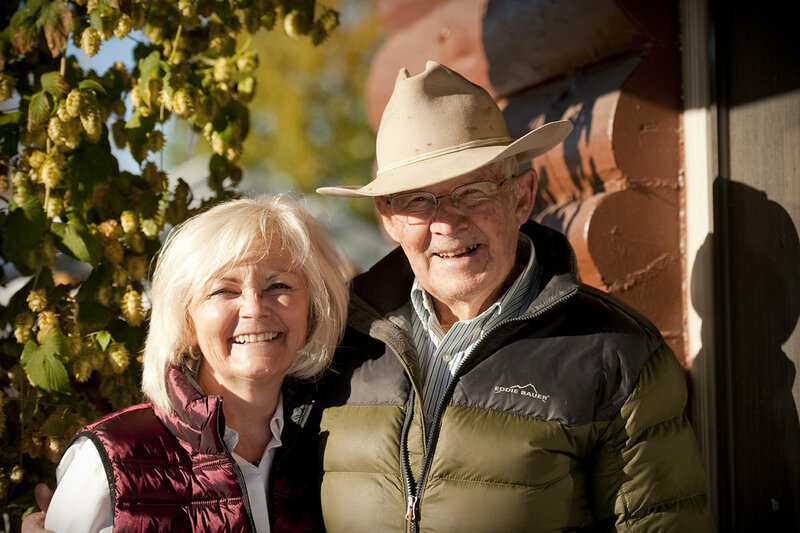 Kathy Carrig Holzer (Dana's mother-in-law, pictured here with her dad) makes and designs the Montana Quarter Necklaces. Working from the Mill Iron Livestock Ranch in Moccasin, Montana, she mixes her creativity with a keen eye for pleasing combinations in her jewelry. Kathy's grand kids get roped into being models for Montana Bones' photo shoots and fashion shows. Jim (Kathy's dad) brings a lifetime of stories from his days as a collegiate National Rodeo Champion (saddle and bare back) and managing historic ranches in Montana. Working out of his saddle shop in Bozeman, Jim makes hand tooled leather accessories, belts, and horse tack. His leather work is often the finishing touch for Montana Bones’ necklaces. Stay tuned for an upcoming article by the Montana Historical Society about Jim's interesting upbringing and career.